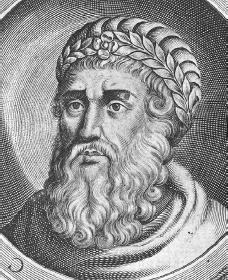 Herod the Great, king of Judea, was an example of a class of princes who kept their thrones by balancing the delicate relations with the Roman Empire. Herod's much-criticized relationship with Rome would keep Judea safe and establish a Jewish state. Judea was ruled by high priests of the Hasmonean dynasty, descendants of the leaders who had freed the country from Seleucid rule. The Seleucid dynasty (312–64 B.C.E. ) began with Seleucus I, who created an empire from part of the area of southwest Asia that had been controlled by Alexander the Great (356–323 B.C.E. ). Herod's grandfather and father held prominent political offices in Judea and established close relations with the Romans, the unquestioned world power during that time. In 47 B.C.E. , when Roman Emperor Julius Caesar (100—44 B.C.E. ) momentarily settled Palestinian affairs, he seems to have entrusted Herod's father, Antipater, with the effective civil government. Antipater named his eldest son, Phasael, governor of Jerusalem and his second son, Herod, governor of Galilee, where he won favor with the Romans by his success in dealing with hostile military groups. In 46 B.C.E. Herod was appointed governor of Coele-Syria and Samaria by Caesar's representative. But with the death of Caesar and the arrival of the new emperor, Cassius (d. 42 B.C.E. ), Herod quickly dismissed his loyalty to Caesar and won Cassius's favor. He also married Mariamne, a Hasmonean princess and granddaughter of the high priest Hyrcanus II. A Parthian invasion in 40 B.C.E. brought another change: Antigonus, a rival Hasmonean, became king of Judea, and Herod had to flee. He left his family in the fortress of Masada and went to Rome. There, Roman leaders Antony (c. 81–30 B.C.E. ) and Octavian (64 B.C.E. —14 C. E.), the future Augustus, accepted him, and the Senate named him king of Judea. not have the correct ancestry to claim the office, and he needed a priest who could not rival him in power. But the Hasmoneans, even those connected to Herod by marriage, would not let go of their claims to the priesthood. By the end of this struggle, which raged for most of his reign, the priesthood had become only a temporary office held at the king's pleasure. When Antony was killed, Herod found it relatively easy to shift his loyalty to Octavian. At the same time, Octavian saw no reason to look for another puppet to control in Judea and therefore stayed with Herod. Antony and then Augustus supported Herod for a long time because he pursued a policy they thoroughly favored—bringing Judea into the Roman Empire. Herod consciously undertook to Hellenize (to copy the great culture of Greece) every aspect of life in his kingdom. Officials were given the titles and functions of royal ministers elsewhere, and non-Jews were given many of the highest posts. Herod also brought his kingdom considerable prosperity. He stabilized the economy and reduced taxes. He encouraged trade and built the splendid port city of Caesarea. His city building had the further purpose of increasing Hellenization, for many of his cities, like Caesarea and Samaria (rebuilt and renamed Sebaste), were intentionally Hellenistic rather than Jewish, even to the extent of having a mostly non-Jewish population. During nearly his whole reign, Herod faced trouble within his own family. As early as 29 B.C.E. he had killed his wife, Mariamne, out of jealousy. As the years went by, the whole matter was further complicated by the question of who would replace him on the throne. Like many people with a strong will to power, Herod could not face the idea of losing it. Three of Herod's sons were put to death, and his brother "escaped death only by dying." When Herod finally did die in 4 B.C.E. , two other sons had some claim to the throne. Augustus finally settled the matter by splitting the inheritance between these two sons and a third one, and not allowing the title of king to any of them. In an age when the existence of the smaller states depended not on their own strength but on the will of Rome, Herod kept Judea safe, secure, and prosperous. And yet, throughout his career Herod suffered from being caught somewhere between Jew and Gentile (non-Jew). He began the rebuilding of the Temple and acted as protector and spokesman for various Jewish communities scattered about the world. But despite his wish to strengthen the Jewish state, he still sought the favor of Rome, and this conflict would prove his ultimate failure. Grant, Michael. Herod the Great. New York: American Heritage Press, 1971. Green, Robert. Herod the Great. New York: Franklin Watts, 1996. Perowne, Stewart. The Life and Times of Herod the Great. New York: Abingdon Press, 1959. Roller, Duane W. The Building Program of Herod the Great. Berkeley: University of California Press, 1998. Sandmel, Samuel. Herod: Profile of a Tyrant. Philadelphia, PA: Lippincott, 1967.